The basic premise is that a wealthy 21 year-old guy gets kidnapped and held for $25 million ransom – and the team of investigators assigned to the case has nine days to find him and return him to his family. The story is told from the perspective of the detective in charge of the investigation and he is a highly likeable character, flaws and all. The novel is very well-written, unique, has a rich cast of diverse characters with interesting dynamics, and an unfolding plot with multiple complications that keeps the reader engaged. The epilogue at the very end brings it all together beautifully. On a more personal note, I resonated strongly with the evolving relationship between the detective and his colleague, another police officer. It was refreshing – and enlightening – to read how these two people strived to determine the best way possible, for all concerned, to proceed with their budding relationship. For life within the police world is different – and keeping intimate relationships healthy can be challenging indeed. I love how this book found its way to me. The author, Gerald, researched me on-line and sent me an e-mail about a year ago, asking me if we could have a phone discussion about the pros and cons of recording a self-published book as an audio book. So we had that chat – and then, when his book was published, he sent me the details on where to purchase it. So I did. 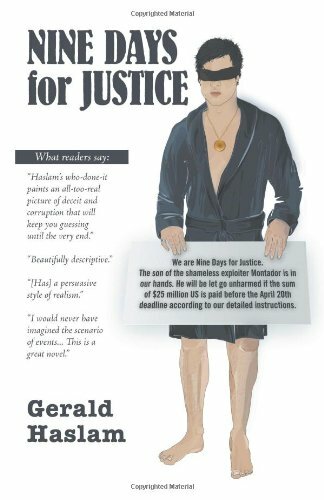 I genuinely enjoyed reading Nine Days for Justice. As an author of a self-published book myself, I can safely say from experience how difficult it can be to break through the barrier that exists – often for very good reason – between readers and self-published books. For not all self-published books are created equal. Some are dreadful. Some are okay. Some are pretty good. Some are in dire need of a decent edit. Some should have stayed as a person’s diary – and so on. But Gerald’s book, I can honestly say, is great. If you do read it, I hope you enjoy it as much as I did. I agree that it is very hard to keep a healthy relationship going within the policing community. However, it IS possible. We are having great success in supporting police relationships through weekend retreats with Best the Odds Together. We are having a great time sharing with great police couples. You are absolutely right, Deborah! I love the sound of the Beat the Odds Together weekend retreat – and know they are making a tremendous difference…keep up the amazing work!